Early Life – Joy was born in Dawley, Shropshire, now amalgamated with Telford, near Wellington. After her schooling, in 1952, she got a job in Selfridges and lived in Wigmore Street where they had a girls’ hostel. She went to St Martin’s Art School in the evenings. A week after Joy had arrived her friend, Maggie, took her to a party in Old Church Street, Chelsea. An old gentleman came over to ask her to dance. It was a party for his model’s French boyfriend, on Bastille day, July 14th. 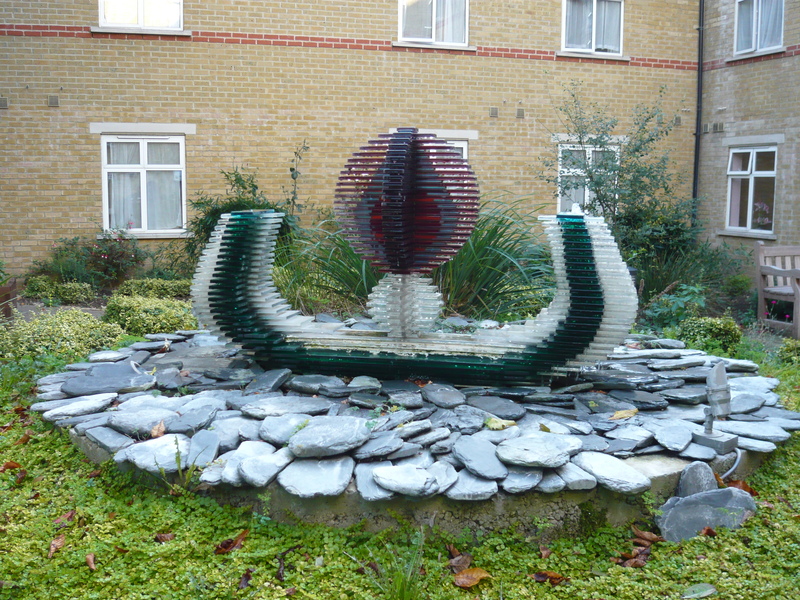 He wanted to leave the party and asked Joy to go too and see his sculptures in his flat in Green Street. That is how their friendship started. Marriage – Joy came into his life when he was having a low time and she helped him a lot without knowing it. He started introducing her to his friends, which was difficult for her as she had never met people like that before. Arthur was 34 years older than Joy. She was looking for different things in life. Arthur was so pleased to teach her. He took her to Paris. He loved classical music. She wanted to learn, and to be open to art. Joy’s teacher, Stella Marsden, knew Arthur, as her father was also a sculptor. Years later she told Joy that she had been worried about how Joy would cope with being married to a sculptor, which is so demanding. Arthur had not been married or had children before. She married Arthur four years later in 1956. World Expo – They had met Father William Kahle who played a big role in their lives. Arthur was a lapsed Catholic and returned to the church and Father William instructed Joy. The first time she went to a Catholic service was when Arthur took her to midnight mass at Westminster Cathedral. He gave Arthur and Joy the introduction to Cardinal Bea, he had permission to do things for the Vatican. Then they met Monsignor Gordon Wheeler, who was the administrator at the Cathedral. This was 1957. He was on the committee for theVatican pavilion for the World Expo in 1958. Arthur was asked to do a maquette for the main hall. There was a competition for a huge sculpture in the main hall. 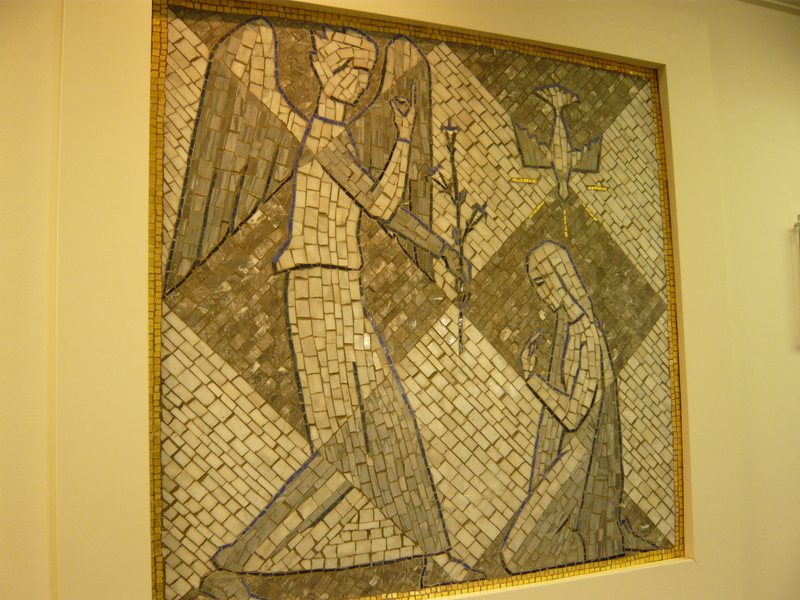 The Work – Arthur was chosen and commissioned. At the celebration dinner Joy was taken aside and told that a lot of the responsibility was hers. It was a huge work for an older man to get done on time, it was the first occasion that Joy realised that she was not just the person who tagged along. It was very hard going because Arthur had never done anything that size. He had to work with other people he did not know. It was the resurrection of Christ and the resurrection of the people too. It had to be sent to Brussels, so they rented a flat there and Joy went to the site and worked all day with him. Joy spoke reasonable French and got friendly with the foreman. It was winter time, freezing, and one did not wear trousers in those days. The Risen Christ was controversial, but it was so powerful, and was constructivist in style. People flocked to see it. It was amazing! After the Expo everything had to come back to the country of origin, so then they had to dismantle it, but Arthur had ‘flu and Joy had to supervise this. Westminster Cathedral put it in the crypt and it has never been used again. Some of the panels are at the bottom of the garden in Carlton Hill, but the whole thing is too huge. Joy has good photographs and a medal from the Pope (John XXIII). They had an interesting time during the exhibition with the visitors. 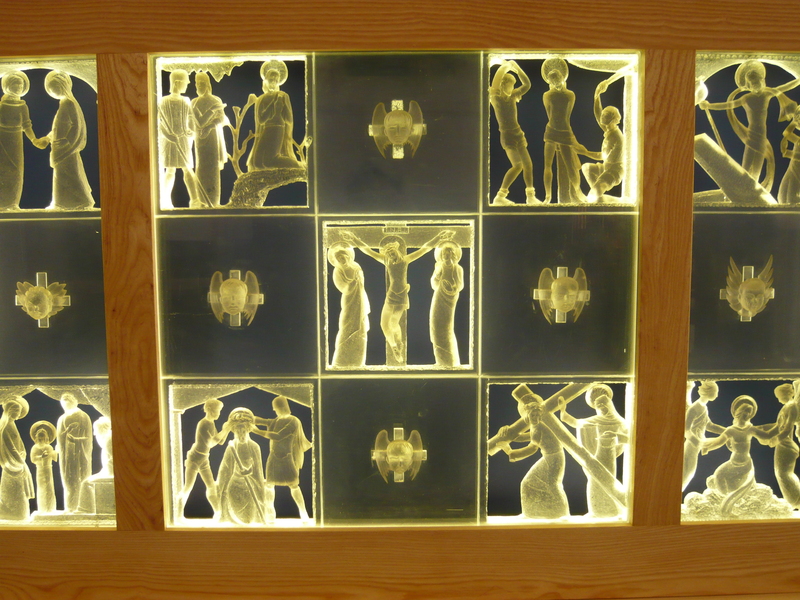 For the British Pavilion Arthur did a coat of arms and the statue of Lot’s Wife which was carved out of a solid block of Perspex. Finding the Studio in Carlton Hill – Arthur had known Frederick Lam, a Viennese architect, who lived in Abercorn Place, and they were very friendly. Mr Lam had found the studio in Green Street for Arthur, which consisted of the billiard rooms from two separate houses. Alice Lam was like a mother to Joy and taught her to make Austrian dishes which Arthur liked. Then Mr Lam found the studio in St John’s Wood. He had built houses there. Arthur and Joy came to see Carlton Hill. It was very dimly lit and owned by an Irish painter, who only at the last minute showed them the studio and the garden and then they fell for it. Arthur’s background – Arthur had been born in Bratislava, which was not called that then. It was Hungarian, then Czech, then Slovakian. He talked about his mother and Prague and Vienna. He talked incessantly about Bali, an artist’s paradise, but the Japanese invaded and he fled to Australia. “He got out on the last plane and the plane flew to Darwin, a great cultural shock – the end. 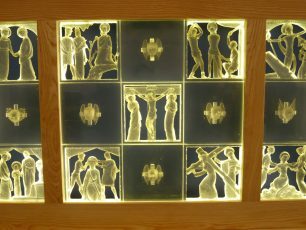 But he was very grateful to the Australians who accepted him, and he went to Sydney and he was very fortunate because there was only one other sculptor there at the time and he got a lot of public commissions”. He wanted to claim his house in Bratislava after the war ended, but when the ship docked in Southamptonthe communists had just walked in there. Neither did he go back to Australia. His last sculpture was commissioned by the State Library in Sydney, New South Wales, and he only completed it just before he died. Coming to Carlton Hill – They bought the lease of the house in Carlton Hill. It was totally different. They had had very little living accommodation in Mayfair. 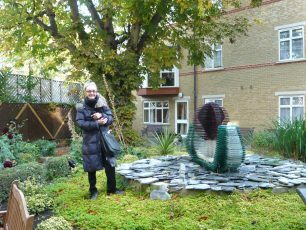 “I loved being able to walk out into the garden with the trees, and loved walking round Hamilton Terrace and Alma Square and little Violet Hill, it was a much more healthy, life totally different from Selfridges and Mayfair. It was a wonderful thing that we did. Yes. The studio was built for Sir George Frampton and as I find out now, he bought the main house and he had moved to Carlton Hill because of the large garden. There were just about three people who lived there, Frampton, Inchbald, a designer, then this Irish painter. I really loved it in Carlton Hill. It was in a state of disrepair and it had partitions in the studio for the painter to have hooks for his paintings. It is not so good as a painting studio because it has a lot of window space. We removed the partitions bit by bit. An alcove became our dining room.Then upstairs we made a floor in part of the attic to take tools and that but you could hardly open the door. Everywhere things were “Oh we’ll need this for that”, and the whole house seemed to be full of bits of wire and stone and all this, everywhere was crowded with things that might come in useful.”. Joy thought St. John’s Wood was absolutely lovely when she came at the end of the 1950s. She could breathe clean air and it was very friendly. She didn’t know where to go shopping at first. There were fewer shops then, now there are lots, open for 24 hours. They had good butchers though. Dominique – Dominique was born in 1961 and Joy was grateful to have the garden. No-one got on buses with pushchairs then. Dominique went to Gitta’s kindergarten in Carlton Hill and she met other mothers who became lifelong friends. There was a huge garden at the back of the property which was wild, so the children from 94 and 88 and others used to play there and they were all safe. There were apple and pear trees. It had been thegarden of Sir George Frampton, it combined 96, 94 and 92. There was a walled circle with roses in the middle. The Harrow School Trust owned the whole area. Eventually the land was sold to a developer and six houses of two storeys were built. The Fleischmanns had a right of way across the land in order to get the sculptures out. Joy makes sure that she is in charge when vehicles use it today as the people in the close are worried about security. Joy loved being a mother, they doted on the child. Arthur was 65 when Dominique was born. Arthur was good at looking after him, having been a doctor at one time. Joy was nervous. Cardinal Bea visited from Rome and came for lunch. Joy thinks of him in his long robes talking to Dominique in his playpen. People came to the studio all the time and Joy had no help. Dominique had the life sized mermaid in his bedroom because there was nowhere else to put it. When people came for a meal everything had to be moved. 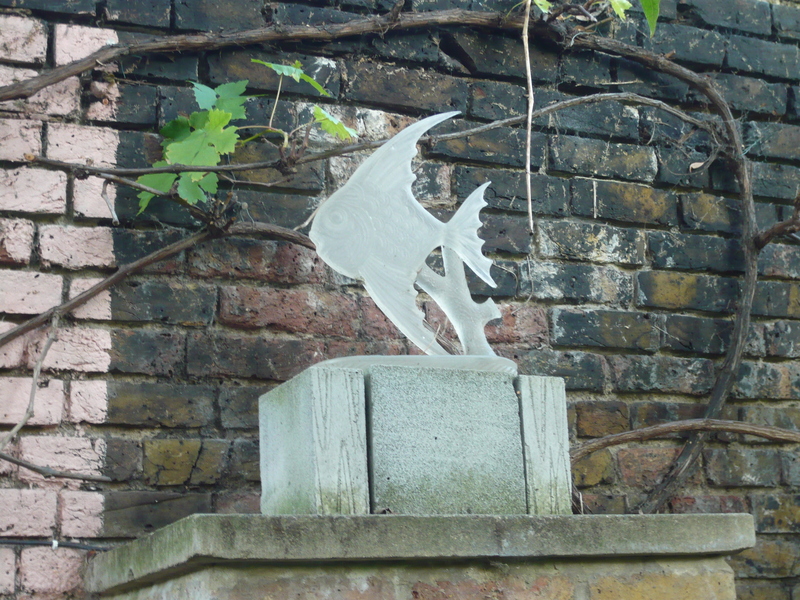 Local Artists – Kormis was a sculptor in Boundary Road. Kormis was not very successful and seemed sad. Willi Soukop was another. 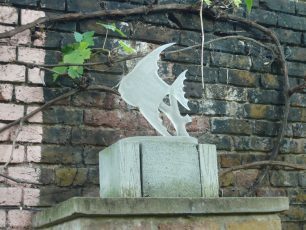 Gilbert Bayes did the relief outside Lords cricket ground and his studio was at the bottom of their garden. He had died and Joy went to his daughter’s classes. She had them copying postcards of old masters. Joy however, painted the sculptures in the garden and was grateful for the opportunity to get started. Joy had done no art herself while Arthur was alive, as she was at his beck and call, typing, driving and kneading the clay, working with him. She gave him breakfast in bed and a massage before he got up. He was good at ideas. “The bread and butter thing was portraits and I would have to do the armature and pass him the hammer and nails and the chicken wire and then make sausages from the clay and then he would start putting the clay on the armature in time for when the sitter came and then I would just be talking to the sitter and make the tea and then when the clay bust had to go to the foundry it would have to be loaded into the back of the car and I would take it to the foundry, so I knew all the different foundries. I hated driving with the clay busts, I was nervous. Artists – Arthur did Sir Charles Mackerras way back in the 1950s. In Green Street they had been invited to a concert and met him. His wife, Judy, and Joy became good friends. Charles was a terrible sitter as he wouldn’t keep still. Judy’s whole life, like Joy’s, was dedicated to her husband, they had a lot in common. Joy wanted to sell a harp, but it didn’t fetch the reserve price. Judy suggested they should hold a concert to raise funds for the museum in Bratislava. Father Oliver from the church of St Francis of Assisi in Notting Hill agreed to hold it. Dominique and Judy recorded it and worked well together. Judy Hornby and her husband and son were also involved. 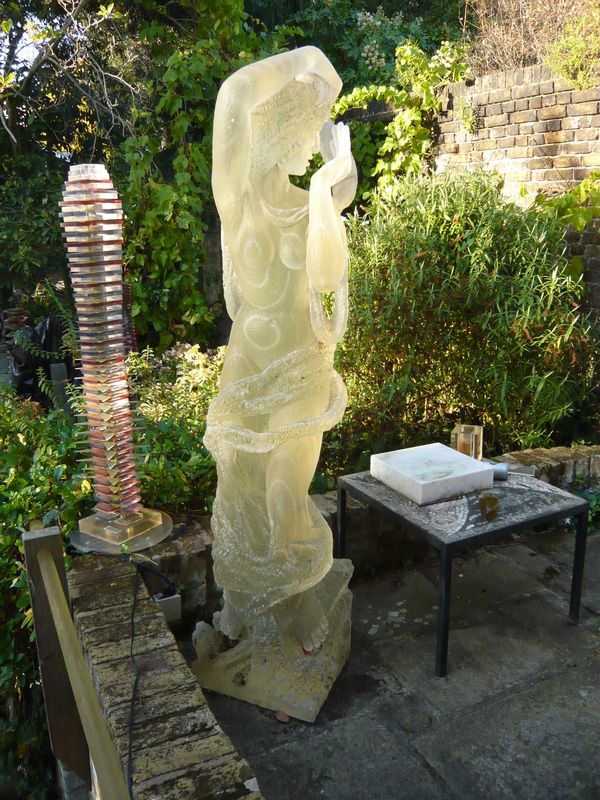 The younger son Nick copied Arthur’s work and became a sculptor himself. 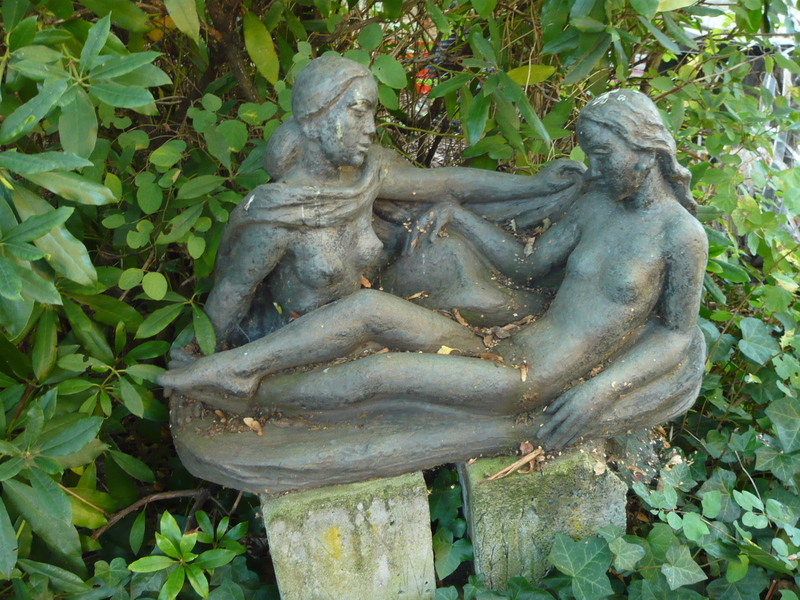 The artistic life was part of St John’s Wood. 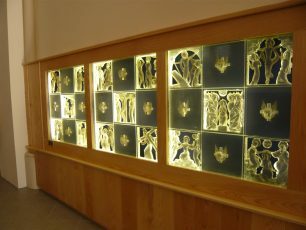 There was the artist who did the glass engravings in Coventry Cathedral, Soukop from Vienna, he was successful and was charming. He did a lot of wood carving and Joy gave him some trunks of wood. Another friend was Sir Charles Wheeler and his wife Muriel and they went to many parties of theirs in Chelsea. Charles did a portrait bust of Francis Chichester. Another party was for Yehudi Menhuin. Their painter friends didn’t live in St. John’s Wood. 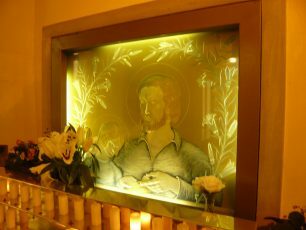 Father Dore – They attended Farm Street Church. Then they got visited by the priest from Quex Road, they were the only non Irish people in the congregation. Arthur did not really encourage Joy in her painting. He was working till about three weeks before he died. He relied on Joy totally. She was strict in not letting too many people bother him. In 1989 he had the commission for the State Library in Sydney, and he completed it, and they went to Tenerife in January and he died at the beginning of March. The body was flown back. The worst day of her life was coming back to the studio. “When Arthur travelled from Sydney to London after the war he met on the ship Walter Worboys and this man was a director of ICI in the plastics division and he said you must come down to Welwyn Garden and see our latest plastic material. So he went down and they showed him this block of Perspex and they had an electric drill and said would you like to try it and so he tried it and he said it would be better if he tried it with his own tools so they said “well have the block” and that is how it started. That was 1949 as early as that. It was the first one he ever carved and he actually signed it and put the date. He used a mixture of wood carving and marble carving tools and found that they needed sharpening a lot. There were a lot of little splinters and he was supposed to wear a mask because some of these little splinters got in his eye and I remember many times going to Marylebone Western Eye hospital and of course to see a bit of Perspex was so hard. It had its hazards but he fell in love with that material and of course ICI were overjoyed as they were just launching it and it was something new and they paid any amount for the photographs and they gave him the blocks and they got a lot of publicity from it. Arthur’s Legacy – Joy was very enthusiastic about preserving Arthur’s work. Dominique helped. Joy was dedicated. She had to go to Australia for the unveiling of the fountain and she cultivated the support there. She kept up that contact. Dominique went to Bratislava and started the contacts there. In 1996 they had the centenary exhibition and they had the permanent place there. Gradually it started. Westminster City Council – Westminster unveiled the green plaque on the house in 1998. 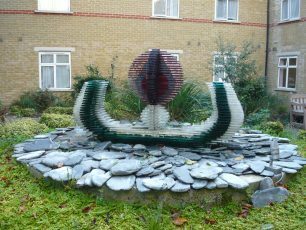 The sculpture of Semaphore in Lisson Green was commissioned by the council when they were doing the new estate and it was to be in the centre there. “Arthur did research and found out that that was where the railway yards had been and the canal was nearby and he conceived this idea of this long boat and in the middle this semaphore, the red and the green, stop and go, flagging down the trains. 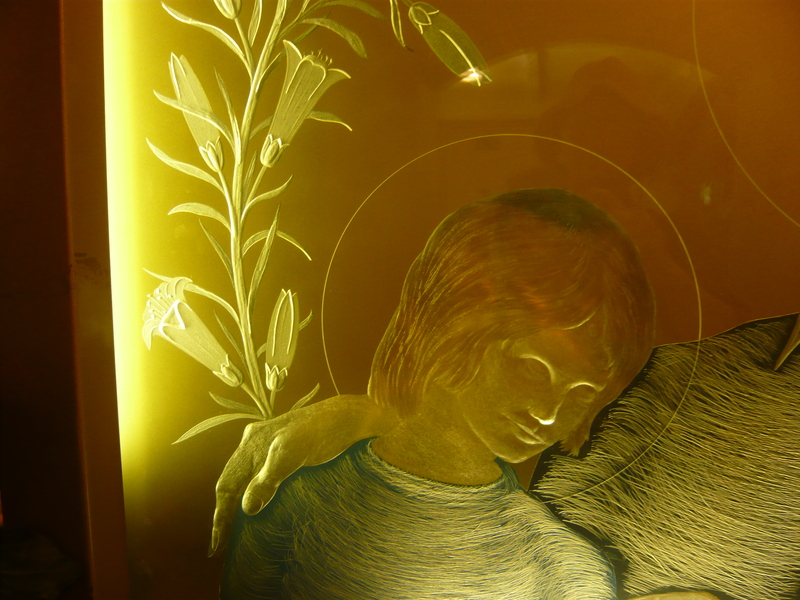 It was quite large in Perspex and the water would flow all over it. When it was complete the council decided that they couldn’t put it in this complex because it would be ruined as everything was being ruined, so they said it should be stored, so we put it in the famous old shed at the bottom of the garden, and it stayed there for 20 years. One day I said we should get it out as it was one of the best pieces, so we got it out and erected it and then I thought I would get in touch with Westminster, different people were coming for a whole year, and at one stage they discussed putting it in the Archives building and then they decided to put it in the residential home in Paddington and that is where it is. They landscaped the whole thing and it is very well done. I have written a whole list of all the things we did. There were always plaques being unveiled. I was lucky meeting the right people at the right time”. Joy’s Own Art – In 1991, or 1992, Joy started drawing, very modestly. Then she started going to the Royal College to do a life class. She enjoyed it very much. It was suggested that she start a class in her studio maybe 10 years ago. It is wonderful that the studio is used. Joy used to be keen on getting a likeness of the model, now she is keen to have it flowing. She sees things much more clearly. The main thing is that she enjoys it. 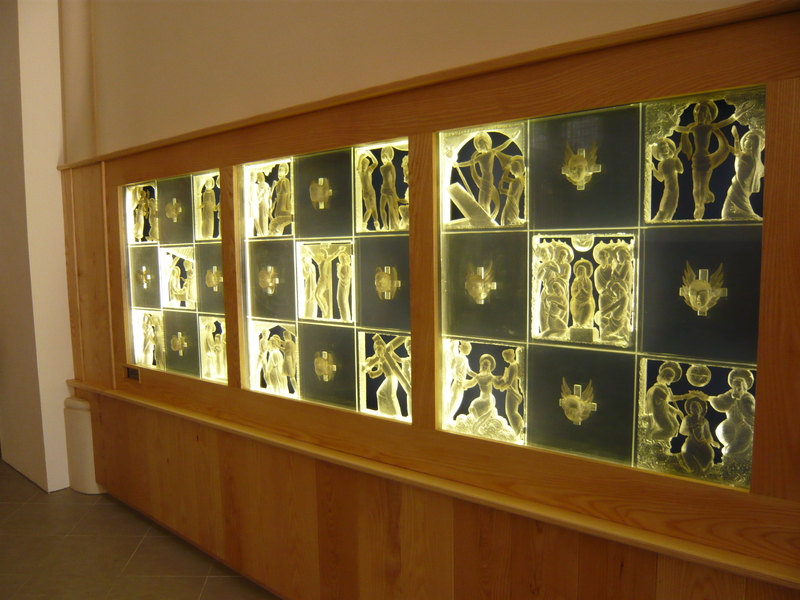 Religious Sculptures – Some of Arthur’s work is very moving particularly the religious sculptures. 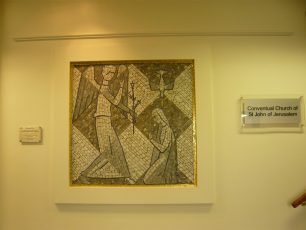 He did the Stations of the Cross at Hinkley in Leicestershire, 14 of them. He did it quickly. When he first started doing something the work was so spontaneous, and then if you keep working on it you can lose something. Some of the maquettes he did during the 1980s are lovely. He never had the opportunity to do anything really big except the Christ for the Expo. There is one maquette in bronze of 6 inches. Joy did try to influence them at Westminster Cathedral to put one in the courtyard there. It was an abstract called Communication. 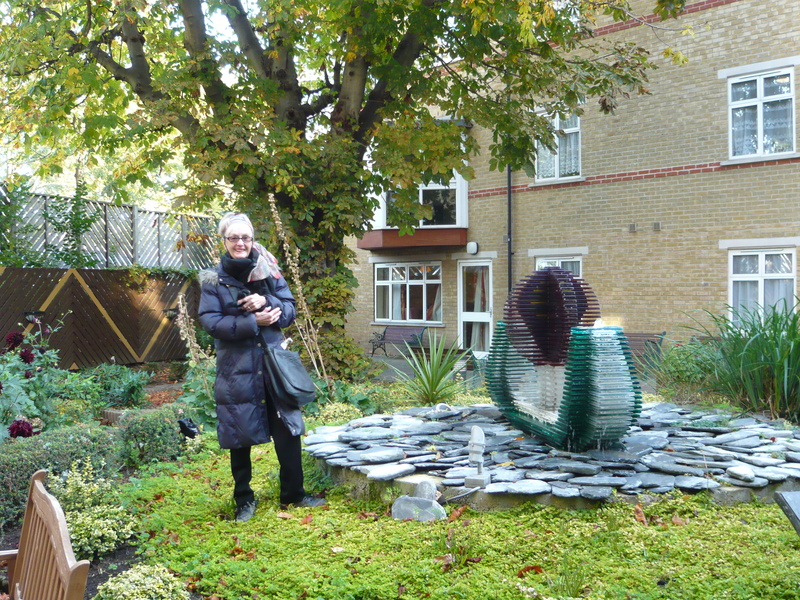 Next year Joy would like to get her friend Philip who is an art historian doing tours of London, to conduct a tour of the Fleishmann sculptures of which there are about 20. “I can’t think of anything I don’t like about St John’s Wood really, I think it is very civilised. 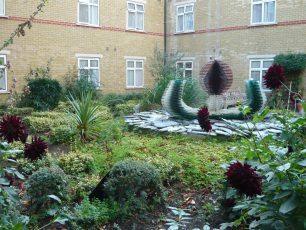 It has still a certain elegance and it is a good mixture, you know you have got the housing estates which they have tried to beautify, not necessarily very successfully, and there is variety. We are very lucky where we live aren’t we, these streets like Blenheim Road and Clifton Hill? And we haven’t got Macdonalds plonked in the middle of it and the garages have all gone, and we have the zebra crossing which puts it on the map and there are some beautiful gardens, old world gardens, some are too neat and tidy but you go down some of those roads and I enjoy just looking into the gardens with the roses and the clematis and some are just all white. This page was added on 26/10/2011.